Every dish from every cuisine has a counterpart in another cuisine – This may be a rather sweeping statement, but it is not too far from the truth. And if they don’t it is easy enough to adapt it to your own cuisine. This is sort of what I did with this recipe. 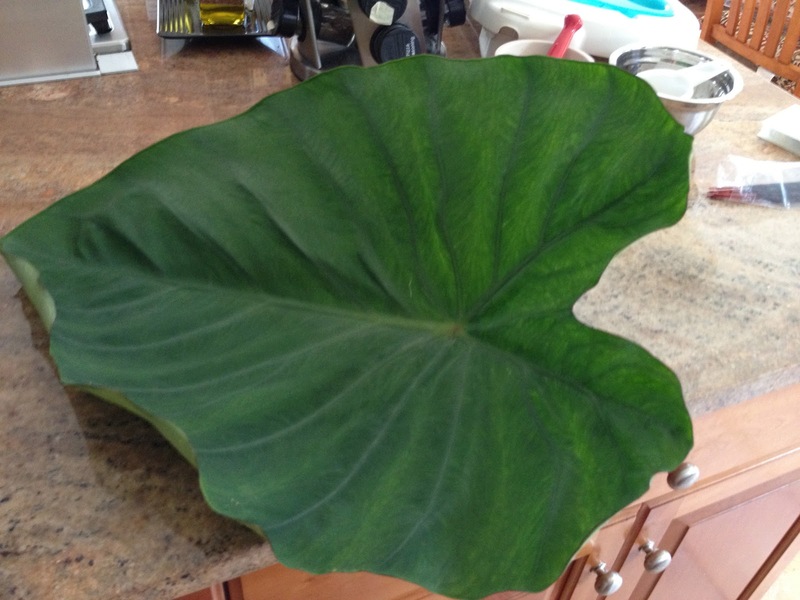 I had these beautiful BIG Taro leaves hitting me in the eye and I knew they were edible and what’s more very tasty too. For those of you who have not tasted taro roots, these have a brown hairy inedible skin and when peeled and roasted can taste a lot like potatoes. Taro roots are used in many different Indian preparations, depending on which part of the country you are from – The roasted south Indian version is best known to me and best liked too. When they are boiled and peeled, they do assume a rather slimy and squishy texture and that to me was not appealing for the longest time and to date I am squeamish about touching these. When we visited Pune a couple of years ago, I saw these teeny tiny kinds that the cook of the house just pinched the skins off without boiling them – She also peeled them before cooking them, an idea I have yet to try. But getting back to the leaves, I made a green gravy type dish with it earlier and that tasted amazing. Their mere size lends itself to a wrapped dish of sorts. 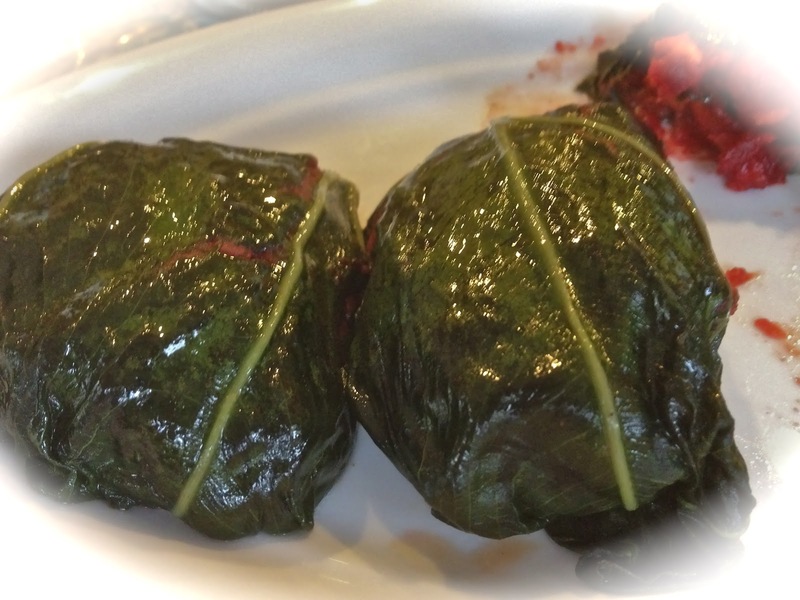 And ever since we tasted the dolmas in the Middle East, I have loved them, had various not to great versions of them back home in the US. They can be really oily and the rice stuffing always made me feel a bit guilty. Here I was with the taro leaves (have yet to buy grape leaves) and the remainder of the stuffing from the sweet-beet samosas and I said … hmm (not rubbing my chin) and this is what resulted from it. A sensational dish – which you’ve got to try in your own kitchen should you be fortunate enough to come across these leaves. The leaf has wonderful ridges to cut right along them – I made my cuts about 4-5 inches wide tapering down to the main stem, following the ridge. 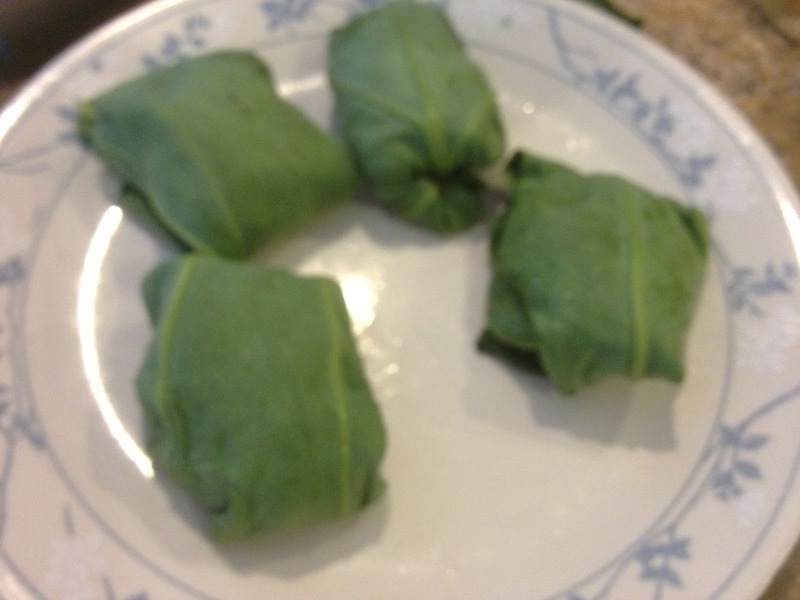 Place the stuffing in the middle and fold over, there should be enough leaf for a generous fold over and wrap. Repeat until all the stuffing is used – An extra big leaf allows you at least 6-8 wraps. Place in your steamer (idli steamers will work too) and cook on medium heat for 12- 15 min. Indication of a cooked leaf is it will turn dark green and look oily. Serve by itself or with rice. 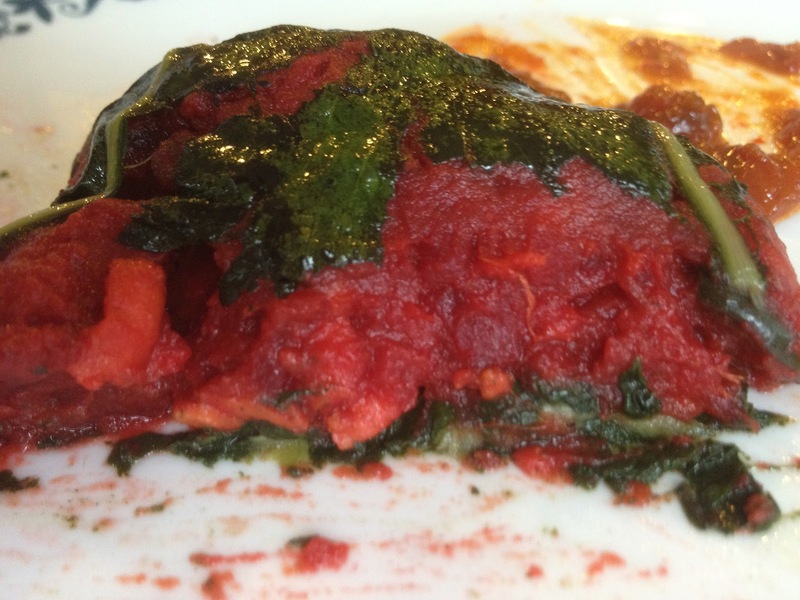 Enjoy this healthful and delicious dish and make your own versions of it and let me know how they turned out. aah priya- this one has my attention ! the stuffing inside it is wow. Really sensational and dramatically presented too. 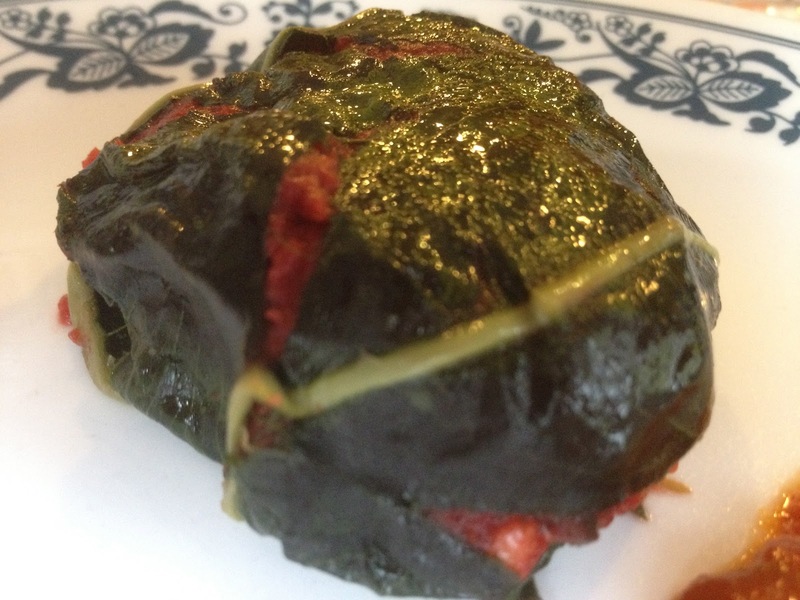 Healthy and colorful,interesting recipe dear. Nice recipe dear..even I do it in somewhat similar way! 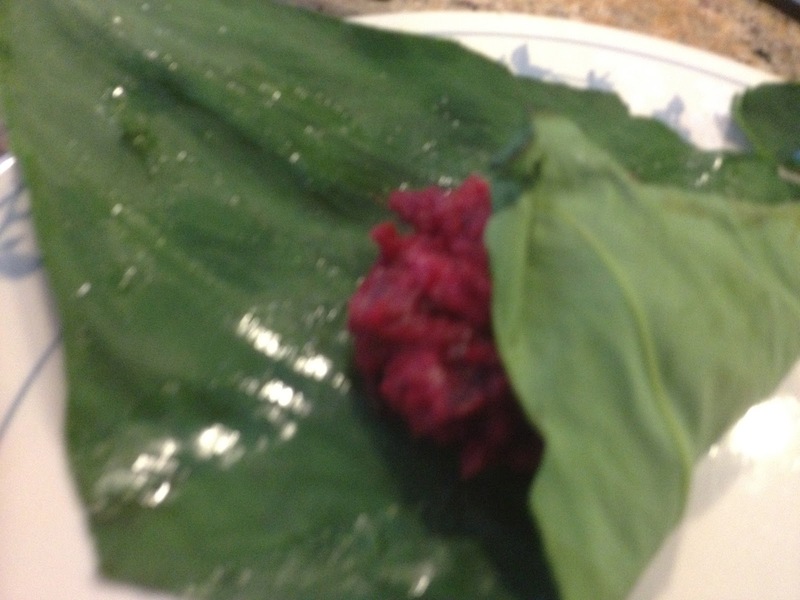 Priya I get a lot of new recipes, cuisine and names from you. 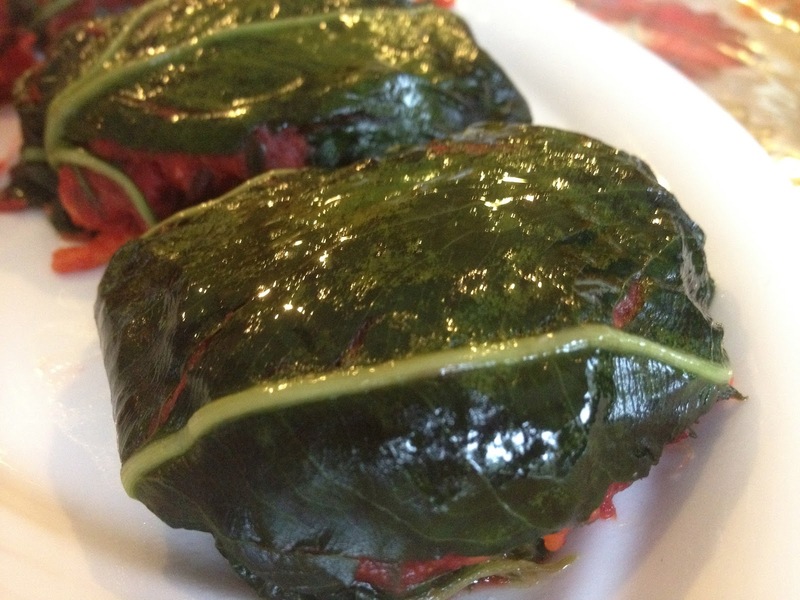 Dolmades I had seen but with grape leaves. Rejected the idea stupid of me, I know now I know of a different dish so Alu vadi that I make is getting a makeover pretty soon. colourful and delicious…..very new to me…. New to me,but looks delicious!! sounds like a great snack! Yummy it looks! Mmm.. this is very nice. Love these recipe. Thanks for sharing. Mhmm I love taro root! I've never tried the root though. 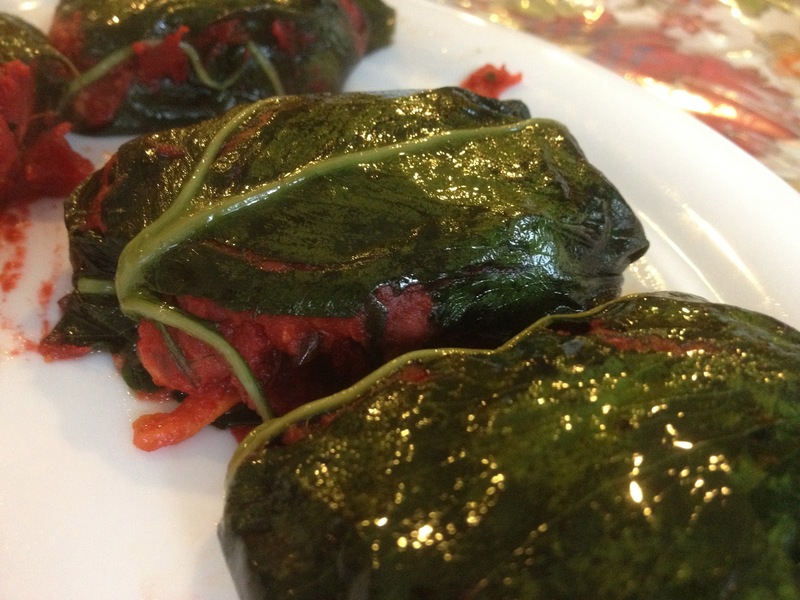 This taro leaf dolmades looks so simple, but delicious.